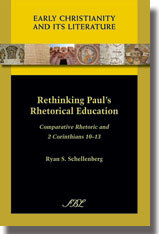 The most recent issue of the Review of Biblical Literature contains two critical reviews of Ryan S. Schellenberg’s Rethinking Paul’s Rhetorical Education: Comparative Rhetoric and 2 Corinthians 10–13, Atlanta: Society of Biblical Literature, 2013 pp. xiv + 406. Did Paul have formal training in Greco-Roman rhetoric, or did he learn what he knew of persuasion informally, as social practice? Pauline scholars recognize the importance of this question both for determining Paul’s social status and for conceptualizing the nature of his letters, but they have been unable to reach a consensus. Using 2 Corinthians 10–13 as a test case, Ryan Schellenberg undertakes a set of comparisons with non-Western speakers—most compellingly, the Seneca orator Red Jacket—to demonstrate that the rhetorical strategies Paul employs in this text are also attested in speakers known to have had no formal training in Greco-Roman rhetoric. Since there are no specific indicators of formal training in the way Paul uses these strategies, their appearance in his letters does not constitute evidence that Paul received formal rhetorical education. Does the Corinthian Correspondence Betray that Paul was Rhetorically Trained?